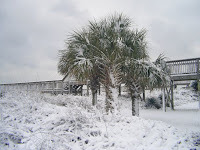 Snow Comes To North Myrtle Beach! 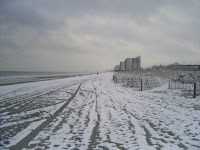 A day after I got back in town from the blizzards in Pennsylvania, North Myrtle Beach had it's own little snow fall! 3.5 inches! There are not many things more beautiful than palm trees with snow on them! Of course it only lasted until lunch time the next day and then it was gone but I did have a chance to snap some photos and thought I would share them with you! 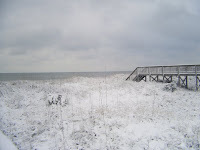 If you were in town, I hope you had a chance to see the beach with snow on it as it really is a unique experience! 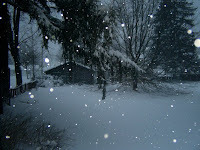 For any of my snowbird friends who are missing the northern snow, I thought that I would share some photos from my trip home to Pennsylvania last week. 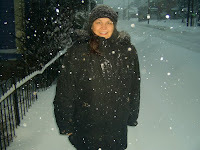 We arrived two days after the first blizzard hit and stayed thru the second blizzard. 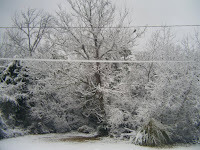 I could not wait to get back to the south! 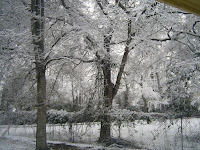 Of course the night after we got back home, North Myrtle Beach had their own "little snowstorm"! It's a lot more fun watching it snow when you know it will be melted by the next day! Thank you for choosing Southern Coast Vacation's as your snowbird winter rental headquarters! Great New Restaurant in Town! I wanted to share a great new restaurant that just opened up this week in North Myrtle Beach called Midtown Bistro. We had lunch there yesterday and it was wonderful! I had the Monte Crisco sandwich and my fiancee had the Chicago Hot Dog. Both were great and came with homemade pasta salad. I fell in love with the decor as the carpet is leopard print-my favorite! Midtown Bistro is open 7 days a week for both lunch and dinner and is locally owned by Jeff and Amy Martini who also own the fine dining restaurant Martini's. It is located at 2004 Highway 17 South in North Myrtle Beach. Thank you for choosing Southern Coast Vacations as your winter rental headquarters!